March 2019 – Cyber Defense Magazine (CDM), the industry’s leading electronic information security magazine has spent the past six months scouring the globe and found nearly 3,000 companies who create and offer the most respected information security products and services. CDM has named less than 200 of these companies as winners of our coveted InfoSec Award for 2019. February 2016 – Internet Telephony has been the IP Communications Authority since 1998. Beginning with the first issue in February of 1998, Internet Telephony magazine has been providing unbiased views of the complicated converged communications space. Internet Telephony offers rich content from solutions-focused editorial content to reviews on products and services from TMC Labs. August 2015 – Internet Telephony has been the IP Communications Authority since 1998. Beginning with the first issue in February of 1998, Internet Telephony magazine has been providing unbiased views of the complicated converged communications space. Internet Telephony offers rich content from solutions-focused editorial content to reviews on products and services from TMC Labs. August 2015 – The Communications Solutions Product of the Year Award recognizes the vision, leadership, and thoroughness that are characteristics of the prestigious award. The most innovative products and services brought to the market from March 2012 through March 2013 were chosen as winners of the Communications Solutions Product of the Year Award. August 2015 – Best Companies Group is dedicated to establishing “Best Places to Work” programs in an effort to distinguish companies who demonstrate and are superior in workplace excellence. They research the dynamics and characteristics of participating companies, analyze the data and produce a “Best” distinction that will make the company, the selected region (or industry) and the organizing partners proud. August 2015 – The International Business Awards are the world’s premier business awards program. All individuals and organizations worldwide – public and private, for-profit and non-profit, large and small – are eligible to submit nominations. June 2015 – An annual achievements and recognition awards program with active participation from a broad spectrum of industry voices, the coveted annual Hot Companies and Best Products recognition program encompasses the worlds best in organizational performance, products and services, executives and management teams, successful deployments, product management and engineering, support and customer satisfaction. April 2015 – SVUS Awards organized by Silicon Valley Communications are conferred in 10 annual award programs: The Info Security’s Global Excellence Awards, The IT Industry’s Hot Companies and Best Products Awards, The Golden Bridge Business and Innovation Awards, and Consumer World Awards, CEO World Awards, Customer Sales and Service World Awards, The Globee Fastest Growing Private Companies Awards, Women World Awards, PR World Awards, and Pillar Employee Recognitions World Awards. These premier awards honor organizations of all types and sizes from all over the world including the people, products, performance, PR and marketing. November 2014 – The TMC Labs Innovation Award honors ground-breaking products that have helped advance unified communications. While innovation is generally a question of firsts, often it involves taking an existing idea and improving upon it. Challenging established standards and introducing different strategies often indicates progression within the industry. September 2014 – Internet Telephony has been the IP Communications Authority since 1998. Beginning with the first issue in February of 1998, Internet Telephony magazine has been providing unbiased views of the complicated converged communications space. Internet Telephony offers rich content from solutions-focused editorial content to reviews on products and services from TMC Labs. August 2014 – Best Companies Group is dedicated to establishing “Best Places to Work” programs in an effort to distinguish companies who demonstrate and are superior in workplace excellence. They research the dynamics and characteristics of participating companies, analyze the data and produce a “Best” distinction that will make the company, the selected region (or industry) and the organizing partners proud. February 2014 – Cyber Defense Magazine honors companies in the Information Security (INFOSEC) industry across a variety of categories, including Forensic Solutions, Vulnerability Management, and Security Information Management. 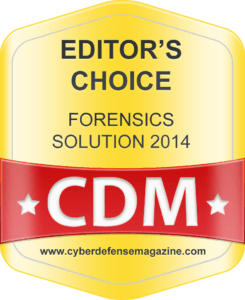 Plixer’s Scrutinizer v11 was named “Editors Choice Forensics Solution 2014” in the first annual Cyber Defense Magazine awards. January 2014 – Internet Telephony has been the IP Communications Authority since 1998. Beginning with the first issue, Internet Telephony magazine has been providing unbiased views of the complicated converged communications space. September 2013 – The Communications Solutions Product of the Year Award recognizes the vision, leadership, and thoroughness that are characteristics of the prestigious award. The most innovative products and services brought to the market from March 2012 through March 2013 were chosen as winners of the Communications Solutions Product of the Year Award. August 2013 – Best Companies Group is dedicated to establishing “Best Places to Work” programs in an effort to distinguish companies who demonstrate and are superior in workplace excellence. They research the dynamics and characteristics of participating companies, analyze the data and produce a “Best” distinction that will make the company, the selected region (or industry) and the organizing partners proud. June 2013 – An annual achievements and recognition awards program with active participation from a broad spectrum of industry voices, the coveted annual Hot Companies and Best Products recognition program encompasses the worlds best in organizational performance, products and services, executives and management teams, successful deployments, product management and engineering, support and customer satisfaction. May 2013 – The TMC Labs Innovation Award honors ground-breaking products that have helped advance unified communications. While innovation is generally a question of firsts, often it involves taking an existing idea and improving upon it. Challenging established standards and introducing different strategies often indicates progression within the industry. January 2013 – Internet Telephony has been the IP Communications Authority since 1998. Beginning with the first issue, Internet Telephony magazine has been providing unbiased views of the complicated converged communications space. September 2012 – Internet Telephony has been the IP Communications Authority since 1998. Beginning with the first issue in February of 1998, Internet Telephony magazine has been providing unbiased views of the complicated converged communications space. Internet Telephony offers rich content from solutions-focused editorial content to reviews on products and services from TMC Labs. August 2012 – Golden Bridge Awards are an annual industry and peers recognition program honoring Best Companies of all types and sizes in North America, Europe, Middle-East, Africa, Asia-Pacific, and Latin-America, Best Products, Innovations, Management and Teams, Women in Business and the Professions, and PR and Marketing Campaigns from all over the world. July 2012 – Best Companies Group is dedicated to establishing “Best Places to Work” programs in an effort to distinguish companies who demonstrate and are superior in workplace excellence. They research the dynamics and characteristics of participating companies, analyze the data and produce a “Best” distinction that will make the company, the selected region (or industry) and the organizing partners proud. July 2012 – The Communications Solutions Product of the Year Award recognizes the vision, leadership, and thoroughness that are characteristics of the prestigious award. The most innovative products and services brought to the market from March 2011 through March 2012 were chosen as winners of the Communications Solutions Product of the Year Award. April 2012 – Network World is the premier provider of information, intelligence and insight for Network and IT Executives. With an editorial focus on delivering news, opinion and analytical tools for key decision makers who architect, deploy and manage business solutions, Network World offers a unique and powerful combination of audiences and resources across Online, Print and Events to meet your marketing objectives. February 2012 – This enterprise-class, flow reporting and analysis tool offers: high-performance Linux appliance collecting over 100k flows per second, new Cisco Advanced NetFlow reports for in-depth network traffic visibility, SLT, Cisco TrustSec, PfR, and Performance monitoring (Medianet). January 2012 – The global, integrated media company selected Scrutinizer from hundreds of applicants based on the softwares ability to easily enable network administrators to monitor and control bandwidth consumption via NetFlow, Netstream, sFlow, jFlow and IPFIX analytics and reporting. August 2011 – These industry and peer awards from Golden Bridge Awards are the worlds premier business recognition program. Organizations from all over the world are eligible to submit nominations including public and private, for-profit and non-profit, largest to smallest including new start-ups. Winners were honored in New York City on Wednesday, August 10, 2011 during the 3rd annual dinner and presentations. May 2011 – An annual achievements and recognition awards program with active participation from a broad spectrum of industry voices, the coveted annual Hot Companies and Best Products recognition program encompasses the worlds best in organizational performance, products and services, executives and management teams, successful deployments, product management and engineering, support and customer satisfaction. August 2010 – With product development led by experienced network technologists, Plixer provides NetFlow analysis solutions for business globally. The EMA analysis notes that Plixer has been delivering network management tools which are ‘specifically adapted to support all of the industry variants’ to organizations large and small for over ten years.